You don’t have to hate Donald Trump to know that he’s a liar. His latest series of tweets about Amazon swindling “the United States Post Office” is particularly deceptive. You can tell, because his latest tweet starts with the phrase, “I am right.” Trump is not right. The Postal Service is actually best buddies with Amazon, because Amazon supplies it with a buttload of business. Some might even joke that Amazon is the reason the Postal Service still exists. None of what’s in these tweets is true, although the Washington Post mention is telling. The part about “our money losing Post Office”is sort of true, but it has nothing to do with Amazon. In 2017, the United States Postal Service lost $2.7 billion, and it’s lost $65.1 billion since 2007. Some of these losses can be traced back to a 2006 law that mandates the Postal Service pre-fund future retirees’ health benefits, so you might not consider it all a total loss. They’re investments in the health of letter carriers’ lifespans! You can attribute the actual losses to a lot of things, but you can’t quite attribute them to Amazon. The online retailer is actually a great friend to the Postal Service. Like a pal, Amazon gives the Postal Service many billions of dollars every year, since about 40 percent of all Amazon’s purchases go through the US postal system. Last year alone, Amazon supplied $7 billion of the Post Office’s $19.5 billion in revenue. That’s over a third. So obviously Amazon and the Postal Service have a special relationship, but it’s not an exclusive commitment. 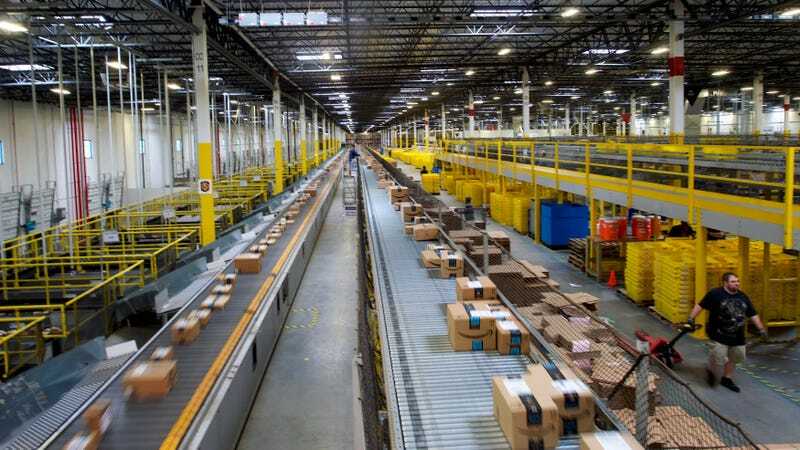 Amazon delivers many of its packages in bulk to US Postal Service distribution centers, where those familiar-looking white trucks take care of the last mile. (Amazon also has its own fleet of logistics specialists, but that’s a whole other story.) As it does with other big shippers, the Postal Service offers Amazon a bulk rate in what’s called a “workshare discount.” The Postal Regulatory Commission reviews each of these arrangements, which means it’s unlikely that Amazon is causing unnecessary expenses for the Postal Service. In fact, it’s illegal for the Postal Service to ship anything below cost thanks to the 2006 Postal Accountability and Enhancement Act. These are all big words and long documents that we shouldn’t necessarily assume that Trump has read. It’s deeply unclear how the former reality TV star arrived at the $1.50 figure that he says the Postal Service loses every time it delivers an Amazon package. Skeptics might point to a special agreement that Amazon made with the Postal Service in 2012 for Sunday deliveries. That agreement is public however heavily redacted, so it’s hard to know exactly what these extra deliveries cost. Given Amazon’s history of being a good friend, there’s a chance that the Post Office actually makes more money by delivering packages on Sunday. But hey, maybe President Trump has access to top secret documents that detail exactly how the financials work. Although sorting through the details would require the septuagenarian to read text. It’s not just the money stuff that Trump gets wrong about Amazon. The president’s claims that Amazon is a “tax-free monopoly” is most definitely false. Amazon collects taxes in 46 states and paid $957 million in federal income tax last year. This year, the company’s tax bill is smaller thanks to credits supplied by Trump’s big corporate tax cut. So in a way, you might say that Amazon’s near billion-dollar tax check partially helped to fund the Postal Service. What a good friend! None of this is to say that Amazon is an angel. The company actually does some pretty evil things. Ripping off its good buddy the Postal Service, however, is not one of them.